School ends in less than a month (hold on while I cry and break out into hives at the thought of being henpecked for 83 days by my beautiful, sweet and loving children). So that means families everywhere will be on the move. For my foursome that usually means an annual pilgrimage to the Outer Banks of North Carolina and one looong (hives are appearing again) car ride to the Florida Keys to visit family. And somewhere in between all of that driving (and hives) and beach time we receive a handful of visitors here in our home town of Charleston. It is the wonderful price you pay to live in this beautiful city. Family, friends and one-offs alike call you up for a visit during the summer months so they can take advantage of our pristine beaches and award-winning restaurants. Who can blame them? Having said that, you had better be ready at the drop of hat for that phone call announcing a visit in, oh, 36 hours!!! I try to keep my house quasi-ready for those impromptu visitors. If you follow these 10 simple steps it makes their stay at your home much more pleasant and reduces the amount of panic that comes over one who is unprepared! 1) CLEAN SET OF SPARE SHEETS– I always have a set of sheets ready to throw on our guest bed and a set available for a blow up mattress (especially when kiddos are in tow). Since these sheets can sit stagnant for some time, place a dryer sheet in with them when being put away. Or have a sachet next to them in the drawer or shelf. 2) EXTRA PILLOWS & BLANKETS-Especially for those cold AC nights in mid-July. Nothing worse than freezing through the night while grasping at paper thin covers. I’m cold just thinking about it. And plenty of pillows for propping up to read in bed. 3) FRESH FLOWERS– This does 2 things: 1. Let’s your guests know you went the extra mile and 2. Masks any pet odors that you may be harboring in your home. You know the ones that you pet owners don’t know exist, but us visitors can smell a mile away? Subtle yet effective. 4) TOILETRY BASKET– We all know what a pain it is to fly with a collection of 4 oz. bottles of shampoo so be kind to your guests and have a mini CVS available in their bathroom. It is so nice to freshen up upon arrival so please have on hand a selection of toiletry basics. If nothing else, a toothbrush! That is one thing they cannot borrow. 5) HOUSEHOLD CHEAT SHEET– This list contains the wi-fi password, gate codes, do’s and don’ts of the house and other nuances they’ll need to know about. It is additionally nice to put some magazines, maps and a list of a few recommended restaurants on their bedside table. 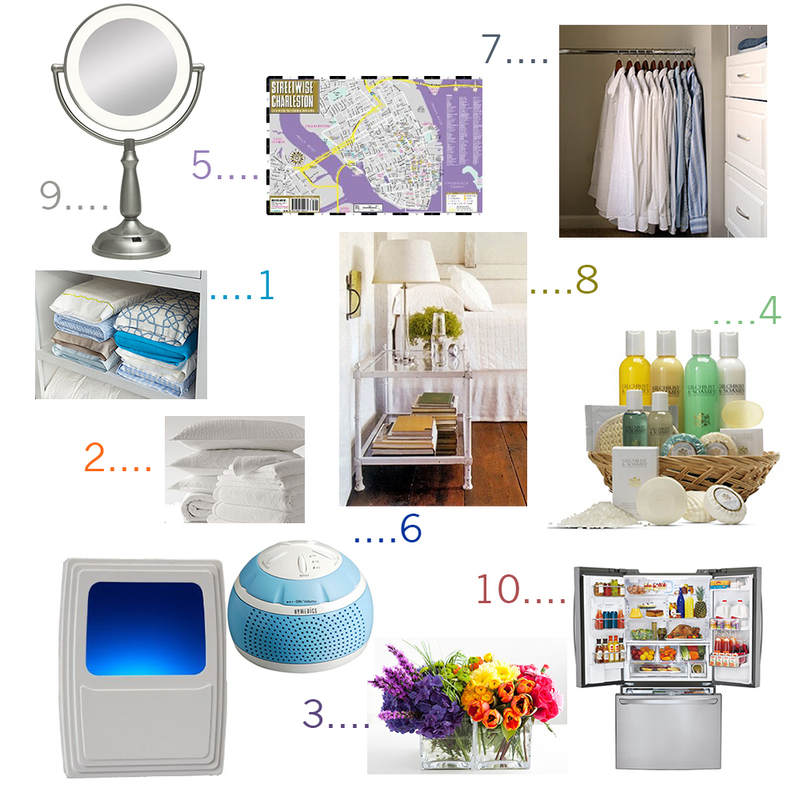 6) AMBIANCE CHECK– Make sure the lightbulbs in their room are working and that a nightlight for the bathroom is available (unless you want them wandering into your room at night). And if you live in close quarters it might be good to have a sound machine available for them or else you might find yourself whispering to your spouse for 3 days. 8) DECORATE SPARINGLY– This provides them comfort without clutter. That was a nice way of saying that you should clear your crap out of the guest room. 9) MIRROR- A full length mirror and a make-up mirror (illuminated if you are feeling generous) are a very nice courtesy. Your guests will feel so much better if they are fully dressed when leaving their room to go out for dinner. Otherwise, they will be asking to use your bedroom mirror during their 32-outfit change and that is just a little too intimate and embarrassing. Well, unless your guest is an old sorority sister and then it would be nostalgic. But only then. 10) STOCK THE FRIDGE– I always try to ask my guests if there are any must haves (or have nots) that would make their stay more comfortable. Do they drink regular or decaf coffee? Do they have any allergies? Are they gluten-free like so many people are these days? Well, you better get to it because, believe it or not, Memorial Day is in 2 weekends and we all know what that means…the first houseguests of the season!! !